The orchids are back in bloom, though not exactly where I thought they were. Check them out this weekend. Both sides of shortcut trail about 100 ft in from the throne. I put the little signs in the right place. And keep your eyes out for ripe wild strawberries soon. Thanks! 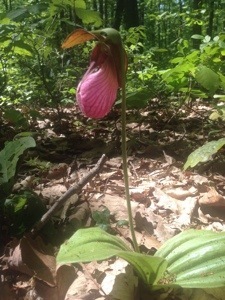 Will stop by to see the lady slippers. Thought they should be out soon.